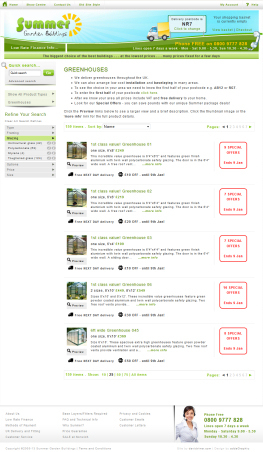 A few years ago I was asked to look into building a web site for a local garden buildings company, Summer Garden Buildings, who sold conservatories, sheds, summer houses and so on. At that time they had four show centres in the East Anglia region and all of their sales were through these. The initial site was just a showcase for the products they sold but raised their profile in the online world and sales started to be made because people found them via the web site. Later on, proper e-commerce facilities were added to the site (which was built with this in mind from the outset). The system selected was SagePay (though called Protx at the time before Sage bought it out) - I had previously set up PayPal for one client and also attempted to get to grips with another e-commerce system from the HSBC bank. PayPal was relatively simple, although biased towards the US market, however the HSBC system was far from easy to either understand or set up - I came across several online forums where people were asking how to get the system running and, obviously, not getting much help. The SagePay/Protx system turned out to be much more user-friendly and had two useful testing levels which meant that, as a programmer, I had far more confidence about the live running of the system before it actually went live. Since implementing the e-commerce section, the company has gone from one that, by necessity, was restricted to sales only in the regions where it had its show centres, to one that now has national sales and delivers to all areas of England, Scotland and Wales. Additionally, with constant 'tweaking' of the site, their Google ranking is now usually in the top 20 and often the top 10. One early addition was to have an alternate site, www.summerconservatories.co.uk, which displayed items in a slightly different way such as with the original manufacturers brands. This was implemented by pointing both domain names to the same physical hosting. By checking the domain name requested by the customer the appropriate content could be displayed. This checking was "hard-coded" (i.e. built into the main PHP code that runs the site). In 2007 it was decided to take this idea even further as they wanted to diversify into other areas such as selling swimming pools, hot tubs, garden furniture and gazebos etc. A revamp of the site gave them the ability to point newly bought domains at the existing hosting and set up the site content themselves quite simply via the back-end administration. They then created over 20 "sub-sites" which were dedicated to specific categories of garden building or equipment. In 2012 it was decided to redesign the web sites and, due to changes in the way SEO was now working, to cut down on the number of web sites. The new design was built so that, with a simple setting, the site could be made to display either style. This meant that the changeover could be made once everyone was happy with the way things were working and, in the event of problems, the old style could be switched back in should the need arise. The new style went live in late December 2012 and, so far, is working well with only minor teething problems. The reduction in the number of sites was handled gracefully with built-in intelligent forwarding handling links to the old site names and pages so that no-one should end up seeing the dreaded 404 page not found error! For more about this multi-site hosting and other web technologies see the Web Technology page.